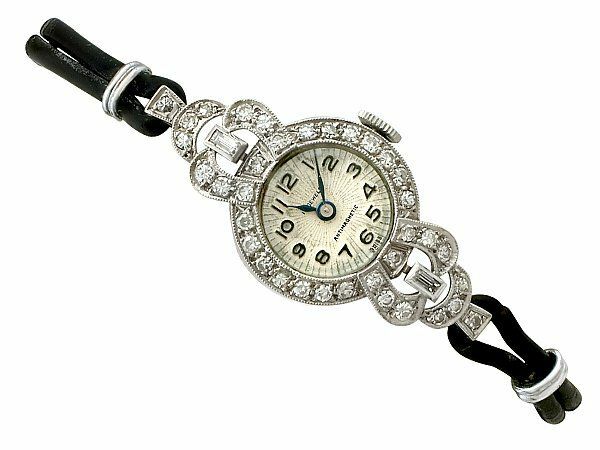 This impressive antique Art Deco diamond cocktail watch has been crafted in platinum. The 1930's cocktail watch has a circular dial with applied black Arabic hour numerals. The face displays the text 17 jewels and antimagnetic, and is fitted with shaped, blued steel hands. This manual wind watch is fitted with a plain, unembellished crown/winder. The watch bezel is embellished with sixteen eight-cut diamonds. This fine ladies cocktail watch features shaped pierced decorated lugs accented with two collet set baguette cut diamonds and a total of twenty, eight-cut diamonds. The watch is fitted with a black leather bootlace style strap which secures to the reverse with a plain unembellished hallmarked tang style buckle. This authentic Art Deco cocktail watch has a plain, hallmarked platinum* caseback and is fitted with a manual wind 17 jewel Swiss movement. This antique watch is supplied with an independent diamond grading report card. This impressive 1930's cocktail watch is fine quality, set with thirty-eight very high colour graded old cut diamonds. The watch is in excellent condition with a clear platinum mark to the interior of the watch back. The leather strap shows some splitting in keeping with age; the core however remains secure. Reflections in photographs may detract from the true representation of this impressive example of Art Deco jewellery/estate jewelry. Length lug to lug 4cm/1.56"